The dissatisfied group showered Stalin with declarations, signed personally and collectively. 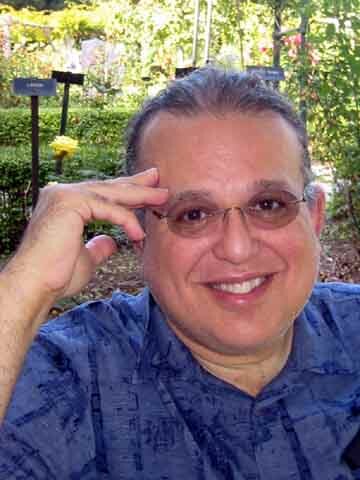 As Ilf and Petrov noted once, "Composers denounce each other on music paper." They overrated composers, they wrote denunciations on plain paper. Of course, I know that an entire brigade of respected Russian dullards wrote a collective book praising that White Sea canal. If they have an excuse at all, it's that they were taken to the canal as tourists one day and the next day any one of them could have been shoveling dirt there. Then again, Ilf and Petrov got out of participating in that shameful "literary camp" anthology by saying that they "knew little" about the life of inmates. Ilf and Petrov were lucky, and they never did find out about that life, the way hundreds of other writers and poets did. Shostakovich gives the impression that everyone will recognize the names Ilya Ilf and Evgeny Petrov, but of course I had no idea who they were. 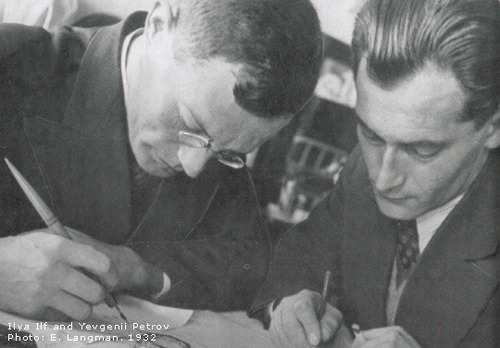 These two men co-wrote several comic novels in Soviet Russia during the 1920s and 1930s and are also known for an account of their 1935 auto trip across the United States. Their works have been made into movies several dozen times including once by Mel Brooks. I was curious, so I ordered a DVD of Brooks' The Twelve Chairs and a new translation of Ilf and Petrov's other novel The Golden Calf. 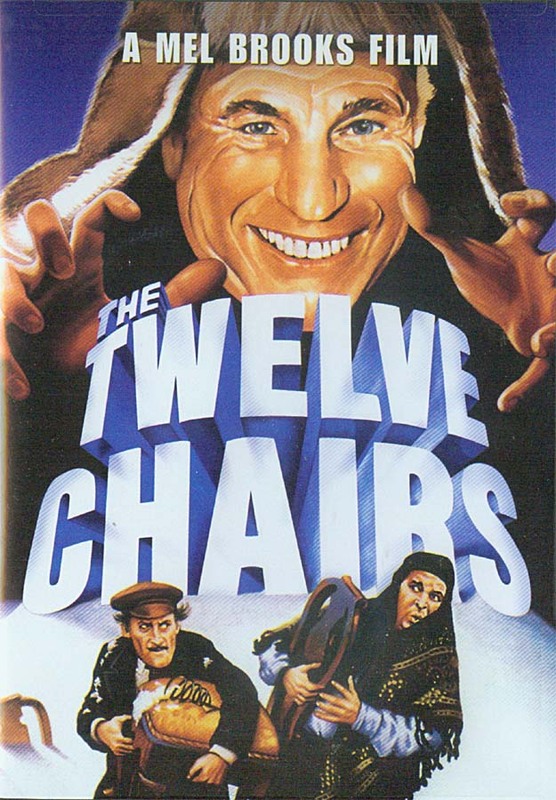 Mel Brooks made The Twelve Chairs after The Producers but before Blazing Saddles. Since those are two of the funniest movies I've ever seen, I expected a lot from The Twelve Chairs. Yes, it's funny but not THAT funny. The leads are played by Ron Moody, Dom DeLuise and a very skinny Frank Langella as the petty criminal Ostap Bender. These characters compete to find a fortune hidden in one of twelve identical dining room chairs which had been taken from a nobleman's family by the Communists after the Revolution. The plot and the film itself remind me of a low-budget It's a Mad, Mad, Mad, Mad World, if you can imagine that classic happening in 1920's Russia rather than 1960s California. At the end of the novel version of The Twelve Chairs, Ostap Bender dies. 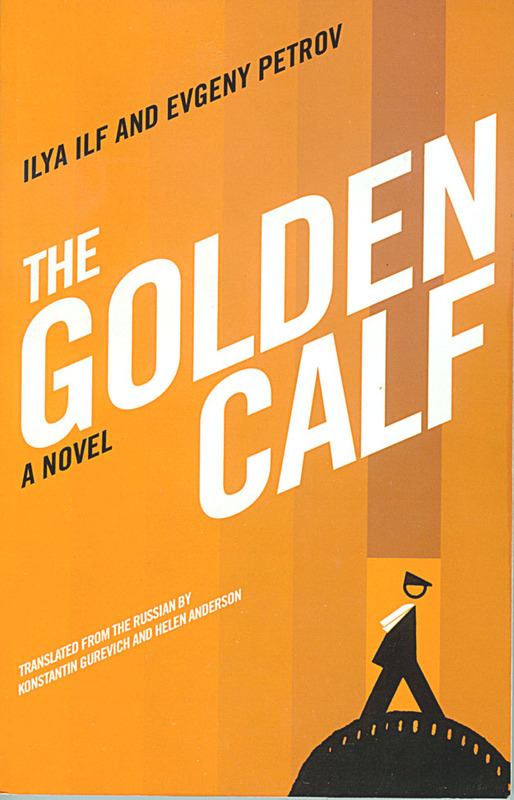 In spite of that, Ilf and Petrov brought him back as the lead character in The Golden Calf. Bender, with a small group of friends of ill-repute, are out to con a lot of money from another Russian who has amassed a large illegal fortune. Although this may have been a tremendously popular and influential book in Russia (where there is even a statue of the lead characters and their junker automobile, a Lorraine Dietrich), I found it only mildly amusing. However, as a window into a time and place far away where there was a very different society, it's quite fascinating. I think America could benefit from a wider familiarity with The Twelve Chairs and The Golden Calf. In a time when greed is still good and we make heroes of rich people, even those who have twisted the law to get ahead, and when 40% of Americans expect to be part of the wealthiest 10% someday, it couldn't hurt us to hear a few counter opinions about the meaning of money and the folly of getting rich quick. Someone needs to ask whether our incessant chase after the almighty dollar is really worth it. And if that question happened to be couched in comedy and comes to the people of the United States via a pair of long dead Soviet journalists who have earned a permanent place in the collective memory of their own collectivist nation, one reviled here for its anti-Capitalist dogmas, so much the better. "The time, that we have, is the money, that we don’t have." One final note: I've mentioned several times how hard I am on the books I read because I carry them back and forth on my daily walks to coffee shops. They are exposed to various elements, the foremost being sweat and coffee. After I have finished a book it definitely looks used. But my copy of The Golden Calf is a curious exception - it still looks great. It's a trade paperback and seems to have been printed on particularly high quality paper with a very resistant cover. The publisher, Open Letter at the University of Rochester, is to be commended for a quality product even in this era of e-readers. The picture of the Golden Calf statue came from here. 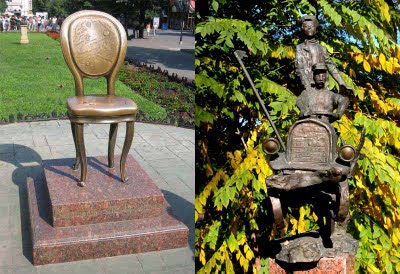 Both statues are located in Odessa which is now part of the Ukraine. At the end of Twelve Chairs, Ippolit slashes Ostap's throat with a razor blade causing loss of blood and so he thinks that Bender is killed, but there is no definite proof in the text that the Great Conman is indeed dead. That's why the authors were able to "resurrect" their beloved protagonist for the second novel so easily. At one point in Golden Calf, Ostap actually refers to that failed assassination attempt and mentions that he survived it thanks only to heroic efforts by some unnamed surgeons. In their original Russian language, these two books are absolutely hilarious. But much of this kind of humor comes from the brilliant writing that uses cultural references and cliches that are painfully familiar to those Russian speakers who grew up in Soviet Union - and only to them. That generation continues to adore the two books, quoting from them often, with many of the expressions coined by Ilf and Petrov becoming part of the everyday conversational language. During the last two decades, however, the Russian culture including the language itself has been changing significantly and at an amazing speed, so that the young Russians opening those books now would probably feel almost as if reading them in a foreign language. And, of course, no translation, no matter how precise, can preserve all of the explosive humor that is contained in practically every sentence of the two books. It is important to note, i think, that while in Twelve Chairs, completed in 1928, the tone of humor is mostly lyrical, Golden Calf, written in 1931, is a much angrier book. Seems like the authors' view of their country was changing and they became considerably more disillusioned and pessimistic. This observation corresponds quite fittingly with what i wrote a few days ago in my comment on this blog's earlier interesting post about Shostakovich. By the way, unlike the first novel, the second one ends with Ostap staying decidedly alive so that the authors would be free to write a possible third novel about his adventures. However, the situation in the Soviet Union deteriorated so drastically in mid-1930s that the kind of sharp satire that these writers may have envisioned was then completely out of the question.